Among all the light-up goodies sold at Disneyland, those faux roses illuminated by multi-colored LEDs are attractive and a popular choice among some park-goers. That's one over there on the right. It seems they are also a reasonably effective remedy for inconsiderate, male behavior. Don't ask how I know that. 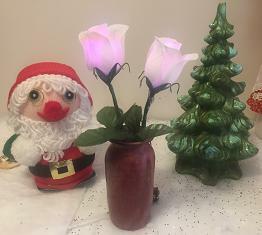 Fortunately, it's relatively simple and inexpensive to add Made With Magic to some Dollar Tree white rose buds to get a similar, but much more versatile, effect that you can enjoy in your own home. And it's amazing how nice these hacked rose buds look in action! 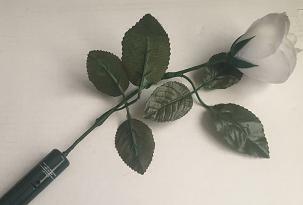 Now, you can get as wild as you'd like with these roses, but for now, let's take it easy and take a look at one possibility for what can be done with a minimum of fuss and/or soldering. ​ ​Since we're going to try to avoid soldering at all costs, we'll need to choose a starting device with a circuit board with LED connections that lend themselves to easily attaching a set of wires. That immediately excludes all devices using surface mounted LEDs and leaves only two possible MWM device choices: the Glove and the Wand. 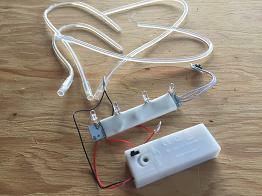 Both use water-clear RGB LEDs with a through-hole attachment to the boards. Between those two items it's no contest. It's almost as if the Glove components were designed specifically for this hack. We get a standalone battery holder with long enough connection wires and an IR receiver also tethered by connecting wires. And the leads on the end LEDs are relatively long. Very nice. To sweeten the deal, the Glove devices tend to run about $5 cheaper than the other MWM merchandise! Why? Dunno. Just get 'em while they're still cheap and/or available. Anyway you look at it, the choice is clear and, if handled carefully, we should be able to make this work without any soldering. That should be good news to many of you who are reading this! The first task is to extract the components from the Glove. This is the trickiest part if you hope to avoid some light soldering! The steps for how to extract the MWM components from a Glove have been covered elsewhere. Follow that link if you need instructions. The wires connecting to the IR receiver and also the ones connecting to the battery holder are very delicate. Surprisingly so for a toy very likely to be used for hardy high-fives. Be very careful to avoid putting any strain on either of those during the extraction process. You might want to add some hot glue or other stabilizing agent to those IR cable board connections as soon as you successfully extract them. I've had them come off just moving the board around a bit. Once you get the board out, the next thing to do is to cut the leads of the outer LED's as close to the base of each LED as possible - leaving us the longest possible board-connected leads to work with. Then those leads need to be carefully spread to fit a 4 conductor female Dupont connector. The extension cable needs to be a 4 wire, Dupont female-female cable at least 30 cm long. To check the connection, slip a new 5mm, diffused, through-hole-type RGB LED onto the other end of the cable. You'll need to separate those leads to fit them into into that connector. Check the extraction page to work out the proper orientation for connection of the LEDs. The LED doesn't need to be altered for the test, but you'll want to shorten it's leads before adding it to the flower bud. You may need to reposition the connections a couple of times until you can verify that all the wires are functioning properly. You'll know you've got it when all the colors of the new LED match the corresponding LED still attached to the board. If you have some sort of controller you can use, sending the command for solid white can be one efficient way to test. 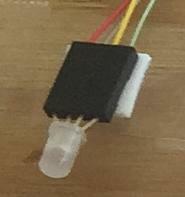 Once the optimal position is found, hold the connector in place using a bit of hot glue between the board and the Dupont connector. You may be able to get away without doing that if the assembly is handled very gently. The rose buds I worked with consisted of basically 6 or so pieces. They're held together by a green plastic piece you'll find in the center inside the bud. The stem is simply pushed into the bottom of that piece of the bud and the two may be separated by just pulling them apart. Next, carefully pull the lower green sepal off that center plug and the outer petal layer. What's left is a plastic cup that gives the bud it's shape and the inner layer of petals that are held together by that center plug. 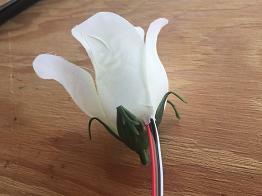 Snake the LED and connector through one of the sides of the cup and into the inner layer of petals. Then carefully reattach the outer layer of petals followed by the sepal. Then push the bud back onto the stem. With any luck, you should have something that looks like the picture on the right. Moving on, the logical final format for this hack is flowers in a vase. And we'll want to conceal those wires as much as possible. The 'stems' of each bud converge on a central piece about 20 cm from the bud. That's where the stems were cut to free up the individual units. To conceal the wires, green floral tape was used to wrap the wires down to about the bottom of each stem. Yes, the wires entering the actual bud are still visible. You'll want to arrange those towards the rear of the final display and/or color them green to help them blend in. Choices for the 'vase' are constrained by a couple of necessary dimensions. The opening needs to be at least 1.25". Measuring the length of the board, plus the cable linking the IR receiver, I get that the vase should probably be 5-6" tall. We want the IR receiver to reach up to the vase opening so it can receive incoming signals. The battery holder may be attached to the rear of the 'vase' using mounting tape, etc. I found a suitable vase at a Thrift store for about $2. Up until that score, I used a 6" piece of 1.5" ABS pipe painted white as the 'vase'. That also works and can be decorated to suit your tastes. Before putting it all together, decide what you want to do about the two LEDs on the circuit board that aren't being used. I thought it would be a cool effect to connect a couple of those light tubes and run them up each rose stem. The tubes were hot glued to the stems and evaluated. Frankly, I found the effect underwhelming. The hot glue changed the look a little and the light output was marginal. For me, it's a pass. Alternatively, you could do nothing or wrap the LEDs with a bit of black electrical tape to hide their output. I found that the vase blocked most of the light such that I really didn't feel like I needed to do anything about those 'unused' LEDs. Check it out for yourself and see what works best for you. To install the components into the 'vase', carefully bend the wires such that the circuit board is parallel with the bud stems. Making sure the battery compartment stays on the outside and the IR receiver can poke out the rim of the vase, slide the board and roses into the vase. 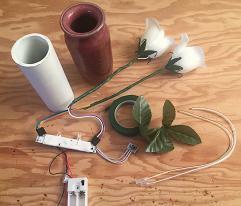 Paste the battery holder on the rear of the vase. Arrange the roses to suit your tastes. Fix the IR receiver board to either a stem or on the rim of the vase such that the receiver is facing forward and able to receive signals. I find that I can use some of the 'leaves' from the buds to conceal the receiver without diminishing it's ability to respond to signal. Flip the switch on the battery holder and make sure that the output to the buds wasn't messed up during insertion into the vase. 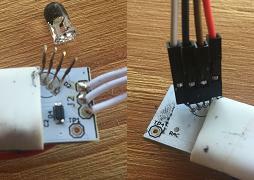 Also use some sort of emitter to test the IR receiver and insure it's able to receive signal. If all's well, take a step back and evaluate your handiwork. Not bad. Mixed in with other elements, it's OK as is. Standalone, those two lonely buds look a little sad on their own. Adding some additional fake foliage might help. You might even try driving more roses from that same Glove board. In a previous post, I showed it's possible to drive up to 12 RGB LEDs from a single Glove board. 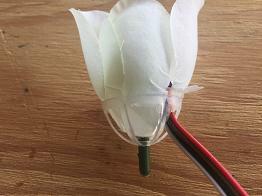 Substitute male-female cables for the female-female cables and connect things up via a mini breadboard and you may be able to get a couple more roses without much additional effort or expense. Have fun and enjoy!